Think you’ve got what it takes to help a bunch of refugees establish a new home? Threats are looming in the shadows, both military and diplomatic, and without strategical prowess, you’re not gonna survive this latest addition to the ever-growing Star Traders universe. Remember Star Traders RPG? Well, even if you don’t, that’s fine. Far as I can tell, there’s no actual connection between it and Star Traders 4X Empires, apart from them being part of the same franchise, and of course, both being complex tactical affairs. Oh and if you’re thinking I’m spouting nonsense, seeing how we’re talking about a mobile game here, all I have to say is… seriously? While it’s hardly on par with, say, Alpha Centauri, from what I’ve seen/played, it has ample depth for both rookie and veteran armchair generals (or the sci-fi equivalent) alike. An entire bloody quadrant! How’s that for scale, eh? But like I said, it will be neither easy nor peaceful, as hostile races are plentiful, all eager to take a bite out of your newly established empire. Because of this, ensuring that your scientists are always hard at work is vital to your survival, as an under-equipped ship won’t be able to survive even a single alien encounter. Could always take the diplomatic route, I suppose, using spycraft, and (temporary?) treaties to keep enemies at bay… while you gather resources and amass a grand army, to then vanquish the poor fools! CONQUEST! 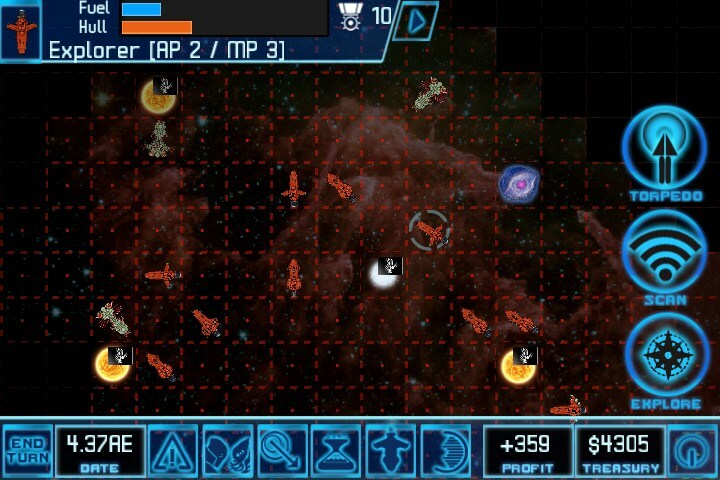 Star Traders 4X Empires is available for Android (Google Play [free – Elite], Amazon [free – Elite]). Greenlight?